Thank you Richard for the drawings. I did not know them! For encouraging you to complete your series, here are drawings of the Musketeers by A Wilke. Thank you for your mail, Charles! Yes, I am hardly waiting for the arrival of the further volumes ! You will enjoy the Alatriste books, they are excellent and entertaining historical novels. I have read some of his other fiction too, again I have enjoyed them all. Happy reading. Thank you for the feedbacks, Gentlemen! The Osprey book on French Musketeers of the Guard is on of the best ever done. It is done by Rene Chartrand of Canada a great military historian and covers both the real and fictional aspects. The books by Arturo Perez-Reverte on the captain are also to be cherished. He purposely tried to emulate some aspects of Dumas. His non-historical works are pretty good to but in avery different vein. An excellent idea to be folowed !!!! 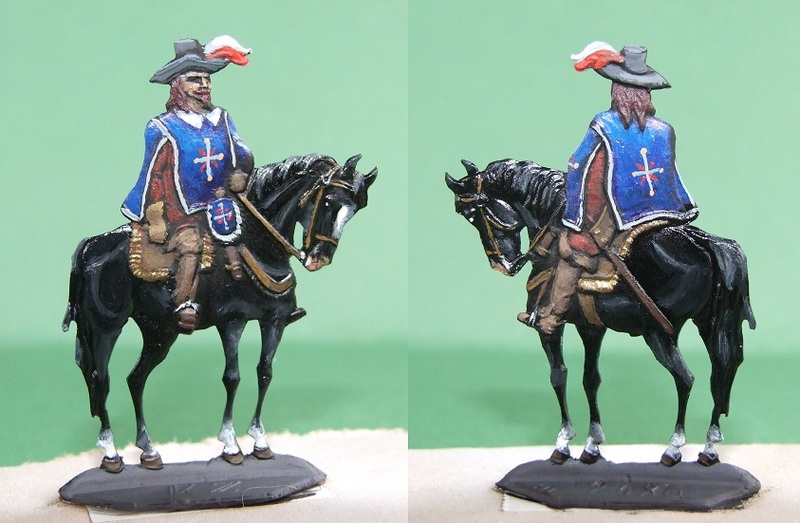 Here is my most recent creation – a mounted musketeer from the household guard of Luis XIII. Maybe it is a shame for a person who is especially interested for the TYW and about the period of the 16 century, but it was only a few days ago, that I struck upon the book „Capitán Alatriste” of Arturo Perez-Reverte. However I saw the film long ago, I did not know that it is available in the original book form, and also in English. So I read it at one go – and I liked it very much. Moreover I dare say, that I haven’t read better book of that era since I read „The Three Musketeers” of Alexandre Dumas. So I started an investigation and it turned out soon, that there are 6 further volumes (7 volumes the all as I know) – that I ordered at once via eBay at once. So I am just waiting for the other books of the story. At this point I felt great mood to paint something of that era. 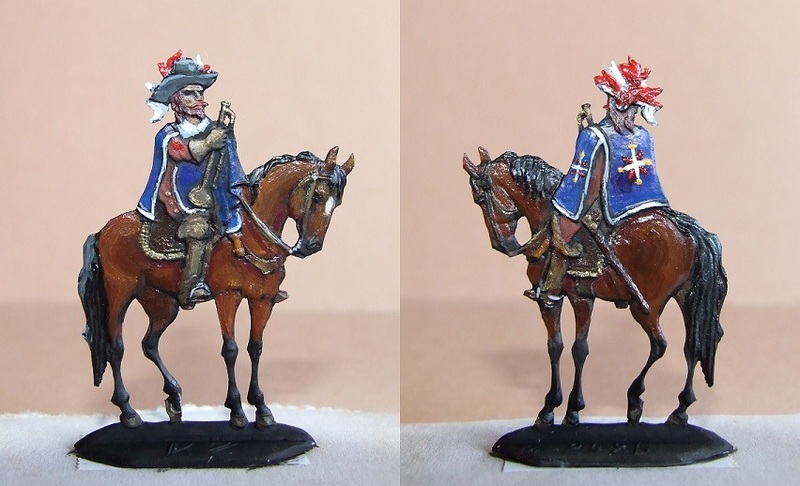 Having look around I came across some figures of the mounted musketeers of Luis XIII. within my spares, I bought a few years ago from Erika Ochel (Kieler Zinnfiguren) and I painted one of them in this weekend. And here is the result. Just back to the Alatriste series: based on the first – starting – volume I dare propose to everyone who is interesting in the military-related circumstances of the early 16. century.